The Hudson Film Society presents movies and video of recorded opera at Village Theatre. The movies and opera are not generally available in the commercial movie theatres. The cost is $70 for the eight-film season and $60 for the six operas. Opera is probably the most expensive performing art form there is, with large casts involving star singers backed by big choruses. Often dancers are required, as well as elaborate sets and lighting backed by an army of builders and technicians. In the pit, there are orchestras of 60 or more musicians. This all adds up to a very high-ticket price to occupy a seat in the best opera houses. But there is a way to see these exciting performances without spending the better part of a months wage. That is perhaps why live opera in high definition, on big theatre screens has become so popular. Even performances after the fact are rich with real theatre entertainment. Eight years ago when the Hudson Film Society was born it was suggested that an opera series might fly. So in March of 2009 the ever popular Carmen was screened to a full house in the Hudson Village Theatre. Response was strong, and beginning in October, a short season of opera and ballet followed to the delight of lovers of this art form, who jumped at the opportunity of witnessing great performances from the world's best stages without going too far from home or breaking the bank. There were some doubters who murmured that 'on screen' really wasn't live, and after all it was a 'live' venue not a movie house. Nonsense. This is the 21st century and why not embrace the new ways to deliver the live experience. Consider the following; Patron A goes the Metropolitan Opera in New York and pays well over $250.00 for a close seat to view an opera. Patron B pays $25.00 to enter a cinema to view the same performance at the same time. Is Patron A seeing it live and Patron B not? Or are both A and B enjoying a live performance of the same opera? Old musty ideas aside, the answer should be obvious except that Patron B is getting a better view if you consider that size does matter. Admittedly the question does get a bit fuzzy if the opera is recorded and shown again at a later date. Encore performances so to speak. Still, it is a great way to enjoy the best singers and stories in your own backyard. A side effect of this new opera world is that rotund singers can't 'park and bark' anymore. The high definition video world, because it is up close and personal, demands real acting as well as great singing and opera begins to realize the potential that this art form has. As an example, this past season the walls of Hudson's converted train station rung with stunning musical excitement and staging in the closing trio finale of Der Rosencavalier. The Film Society has established a few prerequisites for programs they show. The opera or musical must be in a theatre and performed live to an audience. What is shown on the screen is what the audience in the theatre witnessed. Some of the offerings have been seen on television and all are available on disc but there is no substitute for the big screen along with a hundred or so equally entranced viewers. The home screen just can't compete. A concern for a well-planned opera series is a balanced program and this is demonstrated by the coming Hudson season which will open in October with an all time favourite Puccini opera, Madama Butterfly. This will be followed in November with the lightness of Donizetti's Don Pasquale. 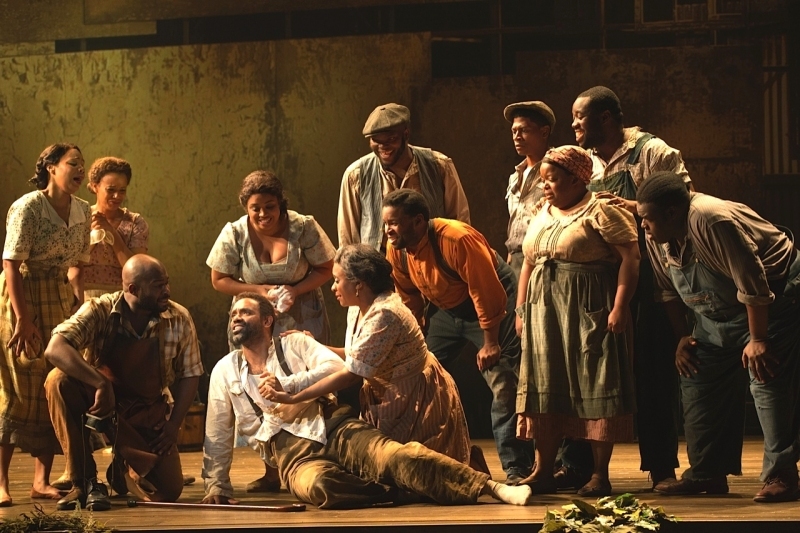 2015 will ring in with perhaps one of the greatest opera of the 20th century, Gershwin's Porgy and Bess. Forget the Broadway treatment it initially received. Gershwin called it a "folk opera," but in its originally composed version it is opera nonetheless. 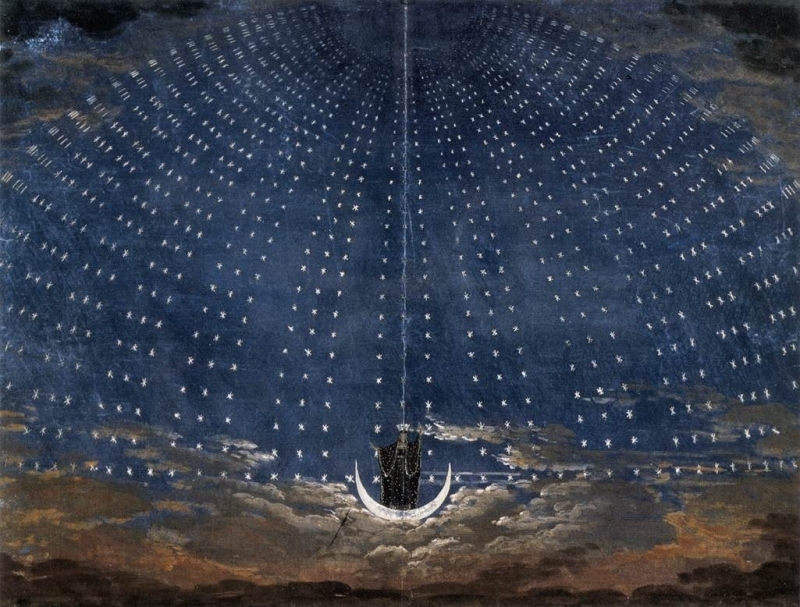 Perhaps a season isn't a season without a Mozart and February will see The Magic Flute, Verdi will be in April with his version of Shakespeare's Otello. The season will be completed with May's Broadway Surprise. The Surprise, is never revealed until the day's introduction remarks and this year it was an exciting rendition of the stirring music of the longest ever running Broadway/West end show, Les Miserables - which has been playing in London since 1985 as well as a long run on Broadway and tours around the world. The 6-performance season is an adventure, and that is the best way to enjoy Sunday Afternoon at the Opera. All 6 for $60.00 might be the best entertainment bargain ever! 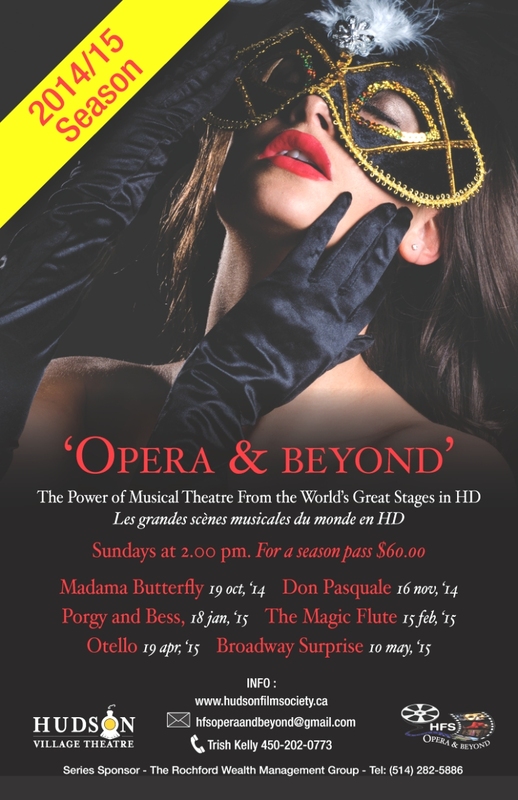 As the Opera & Beyond poster trumpets - The Power of Musical Theatre From the World's Great Stages in HD.